Welcome to this lesson on Neurons and Synapses that is part of the larger course The Brain and Memory. The goal of this course is to help you understand what Neurons and Synapses are and the role they play in the memory process. There are three parts to this lesson. It is recommended you go through them in order as each builds upon the previous lesson. Have fun! The core component of the nervous system, including a great deal of the material in all the components of the brain we have been learning about, is the neuron. A neuron is an electrically excitable cell that processes and transmits information by electro-chemical signalling. Unlike other cells, neurons never divide, and neither do they die off to be replaced by new ones. As a result, they usually cannot be replaced after being lost, although there are a few exceptions. The average human brain has about 100 billion neurons and many more neuroglia (or glial cells) which serve to support and protect the neurons. Each neuron may be connected to up to 10,000 other neurons, passing signals to each other via as many as 1,000 trillion synaptic connections, equivalent by some estimates to a computer with a 1 trillion bit per second processor. Estimates of the human brain’s memory capacity vary wildly from 1 to 1,000 terabytes. Other than in a few rare exceptions, neurons cannot be replaced after being lost. A Neuron is typically considered to have eight basic components. Nucleus - the central and most important part of a cell, forming the basis for its activity and growth. Dendrite - the branched projections of a neuron that act to propagate the electro-chemical stimulation received from other neurons to the cell body, or soma, of the neuron from which the dendrites project. Soma - or cell body is the bulbous end of a neuron, containing the cell nucleus and which the dendrites branch off of. The word "soma" comes from Greek meaning "body". Axon - a long, slender projection of the neuron that typically conducts electrical impulses (called "action potentials") away from the neuron's cell body or soma, in order to transmit those impulses to other neurons. 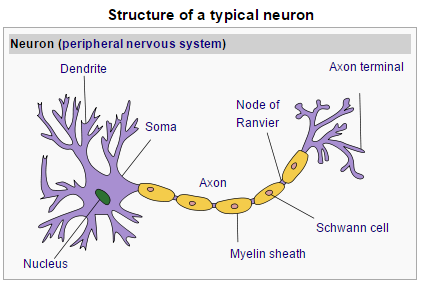 Myelin Sheath - a fatty white substance that surrounds the axon of neurons, forming an electrically insulating layer. It is essential for the proper functioning of the nervous system. Nodes of Ranvier - also known as myelin sheath gaps, are periodic gaps in the insulating myelin sheaths of the axon where the axonal membrane is exposed to the extracellular space. Because of the manner in which the action potential seems to "jump" from one node to the next along the length of the axon. This results in faster conduction. Schwann cell - wrap around axons of motor and sensory neurons to form the myelin sheath. Axon terminal - the ends of the branches of an axon where the impulses are transmitted to other neurons. We continue following path of the electical impluse. This pulse travels rapidly along the neuron's axon, and is transferred across a specialized connection known as a synapse to a neighbouring neuron, which receives it through its feathery dendrites. A synapse is a complex membrane junction or gap used to transmit signals between cells, and this transfer is therefore known as a synaptic connection. Although axon-dendrite synaptic connections are the norm, other variations (e.g. dendrite-dendrite, axon-axon, dendrite-axon) are also possible. A typical neuron fires 5 - 50 times every second. Electrical signals pass from one Neuron to another through the synapse. Select all of the following that are true. The synapse conducts the electrical signal from the neuron dendrites to the axon. The more you pass a specific signal between neurons the stronger that neural pathway becomes. Signals pass easily between neurons due to the synapse. Learning involves building pathways between neurons. Each individual neuron can form thousands of links with other neurons in this way, giving a typical brain well over 100 trillion synapses (up to 1,000 trillion, by some estimates). Functionally related neurons connect to each other to form neural networks. The connections between neurons are not static, though, they change over time. The more signals sent between two neurons, the stronger the connection grows (i.e. the stronger the "bridge" build over the synapse), and so with each new experience and each remembered event or fact, the brain slightly re-wires its physical structure. The interactions of neurons is not merely electrical, though, but electro-chemical. Each axon terminal contains thousands of membrane-bound sacs called vesicles, which in turn contain thousands of neurotransmitter molecules each. Neurotransmitters are chemical messengers which relay, amplify and modulate signals between neurons and other cells. The two most common neurotransmitters in the brain are the amino acids glutamate and GABA; other important neurotransmitters include acetylcholine, dopamine, adrenaline, histamine, serotonin and melatonin. Neural Pathways are static, thus do not change over time. chemicals which relay and amplify signals between neurons and other cells. electrical signals that transfer information from neuron to neuron. chemical messengers which transfer signals through the axon of the neuron. hormones that amplify storage of memory by strengthening the connections. We make and store memories by forging new neural pathways to the brain from things we take in through our five senses. The stimuli that our neurons detect, such as hearing a gunshot or tasting a raspberry, are called sensory memories. That sensory information flows along the neurons as an electrical impulse. As that impulse reaches the end of a nerve, it activates neurotransmitters, or chemical messengers. Those neurotransmitters send the message across the spaces between neurons called synapses and move it along from the neurons in the senses to the neurons in the brain. If we need to immediately use that sensory information, it moves to the short-term memory, for example, when we hear a phone number and have to remember it to dial. To turn short-term memories into long-term ones, our brains must encode, or define, the information. Remember that raspberry? Encoding it would likely include cataloging the fruit's size, tartness and color. From there, the brain cells would consolidate the information for storage by linking it to related memories. During this process, that neural pathway strengthens because of the brain's plasticity. Plasticity allows the brain to change shape to take in new information and, thus, new pathways. But now we get ahead of ourselves. You'll learn more about encoding and consolidation in future weeks' lessons.